But they look disgusting, there’s no getting around it. 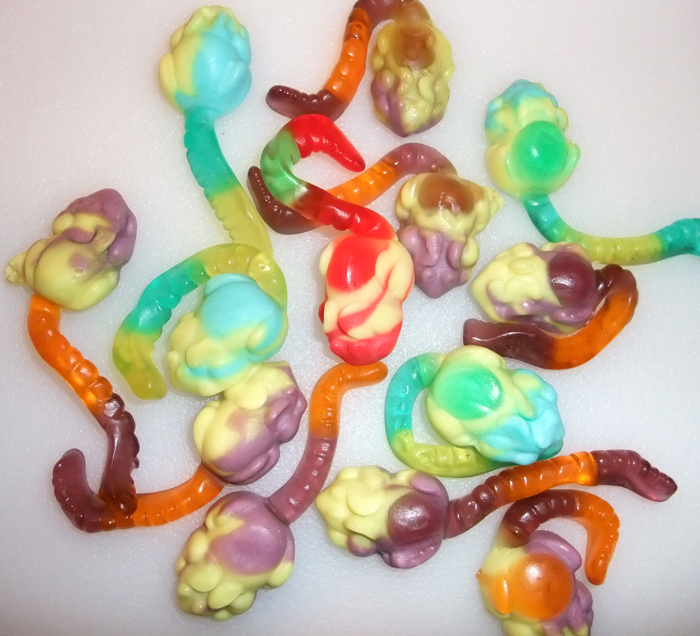 I’m not sure I’ve ever seen a bag of gummies this intriguing and colorful and fun while at the same time so puke-inducing looking. Gotta love the Germans. Look at them closer. LOOK AT THEM!!!! It took a while for me to get the guts to pop these open, but I finally did. 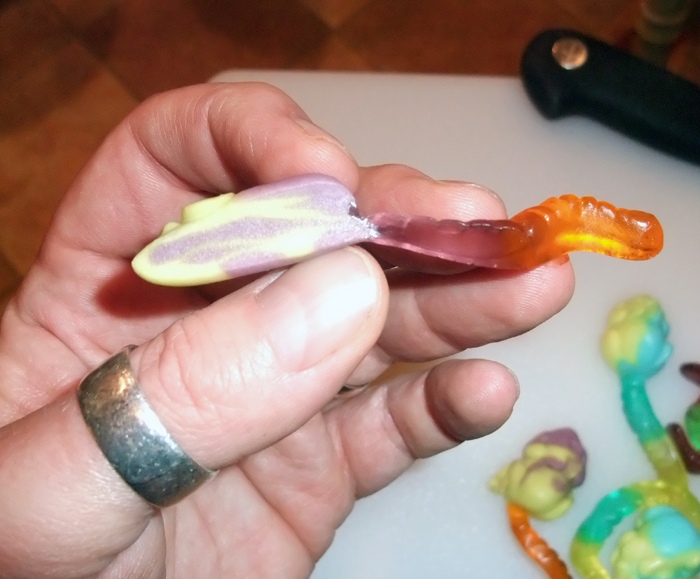 Examining them closer, it’s clear there’s 2 different “parts” to these things: the gummy tail, and the…spongy, marshmallow-like tye-dye lookin’ head. There wasn’t any gentle way to do this, so I bit away. First a bite of the tail, then a chunk of his damn head. Like I mentioned, the head is a soft marshmallow consistency-and it actually has flavorful and aromatic hints of marshmallow, which tripped me out. But there’s also this nice tangy contrasting flavor to the head that is kinda hella yum, and works well with the tail. 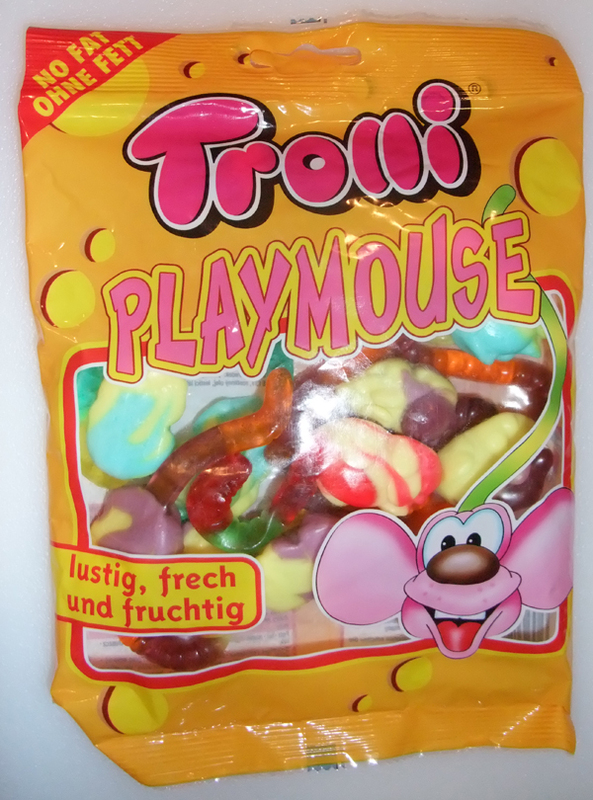 Clearly, these were invented so that we could throw whole mice in our mouths and chew away on them, tail sticking out of our mouths, like giants. Trust me, it’s fun. This doesn’t change the fact that they still look like a bilious looking cross section of a dissected clown’s innards, but…that actually increases the enjoyment. Even Mrs. Guru liked these, and she generally doesn’t like gummies at all, so…I hate to say it, but LADIES AND GENTLEMEN, WE HAVE A WINNER! Yes, these are delightful if repulsive. The tail and head together makes for the best flavor, I think. YOU LIKE BABY! YOU DO NOT BELONG HERE! They couldn’t look worse. They almost appear to be a mistake. But I liked the taste, no doubt about them. I’d buy them if I saw them in US stores. WOW – never judge a book by its cover, eh? Great rating for a candy manufactured by Trolli, I am impressed! These things are pretty disgusting looking. They really look like little rats.It wasn’t easy to put them in my mouth but I’m glad I did. One of my fav’s from Trolli.